During a dive near Ticao Island, in the Philippines, a family and their guide made an incredible encounter. They spotted a manta ray swimming nearby with a long fishing line wrapped around its body. The line seems to have been there for a long time, as it had cut a large tear in the animal's wing, about 12 inches long, according to Jane Headley, one of the divers, who uploaded another version of the video below to YouTube. The line had also caused a significant gash all across the female ray's back, and was growing barnacles, further proof of its age. The Headley family's diving guide, who Headley refers to as GL, immediately sprung into action, pulling out a small pair of clippers and carefully approaching the animal. Understandably wary, the sea creature recoils a number of times as GL attempts to cut her free of the line, but soon seems to understand that he means well — Headley herself says the ray stops trying to get away from him after a while. When she is finally freed from the line, she even stays with them for several more minutes, having visibly established a beautiful bond of trust. 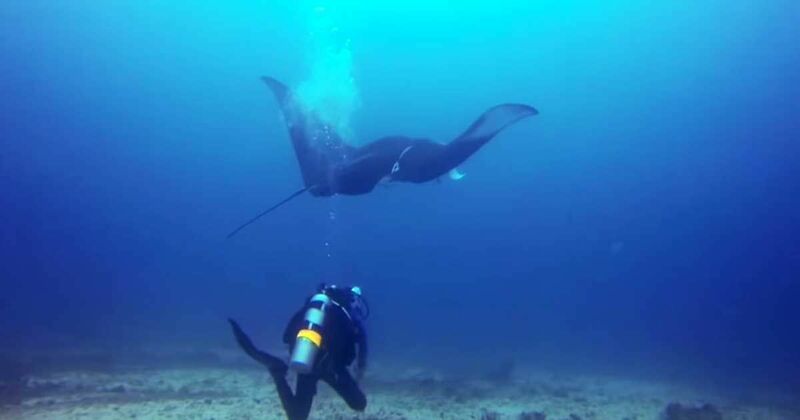 For those worried about the ray striking the diver with its tail, Enchanted Learning explains manta rays, as opposed to sting rays, are harmless creatures and do not have a stinger in their tail. While not necessarily approachable creatures per se, manta rays generally do not react to divers in a negative way. Watch the sweet, visually impressive video below, and make sure to share this great rescue with your friends.